The Khalifa Port is located about five kilometres offshore from Taweelah, in Abu Dhabi, on a reclaimed artificial island. Image courtesy of Abu Dhabi Ports Company. The Khalifa Port will be constructed in five phases. Phase one is scheduled to be completed in the fourth quarter of 2012. Image courtesy of Abu Dhabi Ports Company. Shanghai Zhenhua Heavy Industries (ZPMC) is supplying the STS cranes for the new port. Image courtesy of Abu Dhabi Ports Company. 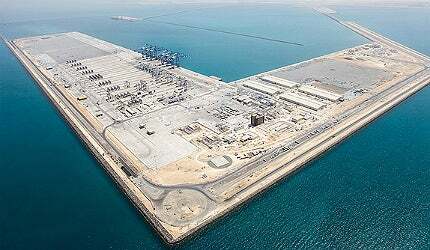 The port forms part of the 418 square kilometres Khalifa Industrial Zone Abu Dhabi (Kizad). Image courtesy of Abu Dhabi Ports Company. All the five phases are expected to be completed by 2030. Image courtesy of ADPC. Construction cost of the first phase is estimated to have cost AED26.5bn ($7.2bn). Image courtesy of ADPC. Khalifa Port is located about five kilometres offshore from Taweelah, in Abu Dhabi, on what is a reclaimed artificial island. The port, once fully developed, will be one of the largest ports in the world. "Phase one was officially launched in December 2012. Construction cost of the first phase is estimated at AED26.5bn ($7.2bn)." The port forms part of the 418 square kilometre Khalifa Industrial Zone Abu Dhabi (Kizad), being developed between Abu Dhabi and Dubai. The port is owned by Abu Dhabi Ports Company (ADPC) and is being operated by Abu Dhabi Terminals (ADT) under a 30-year contract. Khalifa Port is being developed to cater to the industrial cargo generated at Kizad and also to handle the container cargo diverted from the neighbouring Mina Zayed Port. The Mina Zayed Port is scheduled to be closed in the future. The project is also expected to diversify the economy of Abu Dhabi, which is dependent on the petroleum sector. Khalifa Port is expected to contribute up to $22bn to Abu Dhabi’s GDP in 2030. Khalifa Port is being constructed in five phases. Commercial operations at the port commenced in September 2012. Phase one was officially launched in December 2012. Construction cost of the first phase is estimated at AED26.5bn ($7.2bn). Emal’s berth, which is also part of phase one, became operational in November 2010. Emal’s berth caters to its aluminium smelter, which is one of the industrial units in the Kizad. Construction of phase two is scheduled to begin in 2013. All the five phases are expected to be completed by 2030. Khalifa Port is being developed on an artificial island which has been built using the material dredged from the access channels and basins. It is being located away from the shore because of the presence of the Ras Ghanada coral reef. ADPC has built a nine kilometre artificial breakwater to protect the reef. The port is connected to the mainland through a causeway and a one kilometre bridge. The port has been dredged to a depth of 16m to accommodate large container ships. It has a semi-automatic container terminal and the principal quay wall is 3.2km long. The Khalifa Port currently has a capacity to handle two million TEU containers and eight million tonnes of cargo annually. Once fully operational, its capacity will increase to 15 million TEUs and 30mt of cargo annually. The port will feature a 7.4km quay for 22 container berths, a 12.6km quay for 63 general cargo and RoRo berths, plus a 2.4km quay for six dry bulk berths. "Once fully operational, its capacity will increase to 15 million TEUs and 30mt of cargo annually." The phase one container yard currently features 30 automated stacking cranes (ASC), 20 shuttle carriers and six Super Post Panamax ship-to-shore (STS) quay cranes. The cranes have a lifting height of 44m and weight of 110t. The yard will be equipped with three more STS quay cranes and 12 ASCs which will be operational by March 2013. The semi-automated container terminal has an automated gate control system, which will reduce the truck turnaround time as well as track every container move. Onshore facilities of the port include customs, immigration, container freight, inspection and security. Bechtel has provided project management services including coordination of master planning, designs and construction. Halcrow has undertaken the port master plan, marine infrastructure impact assessment (MIIA), environmental impact assessment (EIA) and site investigations. The six Super Post Panamax STS quay cranes were supplied by Shanghai Zhenhua Heavy Industries (ZPMC) in two instalments of three cranes each. ZPMC will further supply three STS cranes and 12 ASC. The Gate Control System is being provided by Dalosy Industrial Systems (DIS). Terex has been contracted to supply 20 diesel electric sprinter carriers. TMEIC GE provided 30 Konecranes automated stacking cranes (AST). Bromma supplied 34 all-electric crane spreaders. Drydocks World Dubai shipyard is the largest ship repair facility in the Middle East. Qatar is currently constructing a new container port located between the municipalities of Al Wakrah and Mesaieed.